Make this fun shaped cubby house project for gifting and crafting. Simply print, cut and assemble! 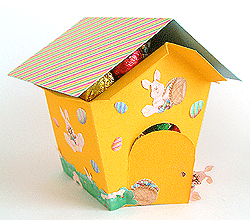 Add your own embellishments such as stickers to make your “Cubby House Gift Box” more personalised. Print the Cubby House template onto your desired card stock. Cut the roof and house out carefully and score along foldlines. Cut door out leaving one side as the hinge for package opening. Fill your Cubby House with candy or gift. Stick roof onto the house. Place a sticker (or sticky tape) over door to close gift box. Decorate and personalise your Cubby House with stickers, cutouts or other embellishments. Copyright © 2003 – 2004 Qualistyle Pty Ltd and Janlia Chong. All Rights Reserved for all logos, trademarks, pictures and templates. Any use, copying, or reproduction of the logos, trademarks, pictures, templates and contents without prior written permission by its owners is strictly prohibited.